The Real Estate season is upon us. Due to the warm weather, there were over 15, 000 temperature records broken in the month of March in the United States. Real estate, recreation and landscaping companies have experienced increased sales or customer demand thanks to the warm weather. From an economic standpoint there could be some adverse effects on commodity prices, since farmers and agriculture businesses are concerned about how the temperature spikes will impact their crops later in the growing season. In every economic condition there are give-and-take variables. The housing and real estate markets got into full swing this year about 45 days earlier than normal – which doesn’t necessarily mean it will increase overall unit volume, but it may distribute this demand more evenly over the summer and fall months. The backdrop to any housing market is the economy, employment figures, consumer confidence, savings rates, inventory and the overall affordability ratings of the homes in the marketplace. Here are several indicators that will make this housing season the strongest market since 2007. As we launched this publication in January, we noted that it was, indeed, an election year economy, and the current administration can’t afford to have the housing and/or employment figures get any worse. In fact, every economic indicator supports some signs of economic strength, but with some clear vulnerabilities. Having said this, the political economy is going to direct the attention both toward and away from the frustrations of the economy. This is a result of the political mood as every electable candidate focuses on a vision that reflects hope, optimism and a brighter future. These political sentiments tend to mask some of the more troubling signs that actually exist, or that people feel are underlying our economy. But the political economy has already steered public policy in a more economically favorable direction – toward banks, housing, real estate and taxation. Let me explain. Going into an election year, we see President Obama proposing to cut corporate tax rates from 35% to 28%, something that otherwise would be ideologically difficult but, in a political economy, such economic measures are popular and will support the expansion of small businesses. Secondly, influenced by the administration, the European Union is slowly testing a proposal that was otherwise called the Robin Hood Tax, which would tax various transactions from some banks and distribute them to the worlds poor. Taxing transactions would not deal with the heart of the financial crisis and the institutional weaknesses that exist; it would drive business away and therefore depress the European markets even further – once again, we can thank the political economy for this as well. Despite high oil prices, the Euro crises and political obstruction in Congress, the private sector continued its 25-month job growth streak in March. In March, 120,000 jobs were added across 29 states (while another 20 states lost jobs); overall this presents both promising and challenging signs as in the month of February, 42 states added jobs. 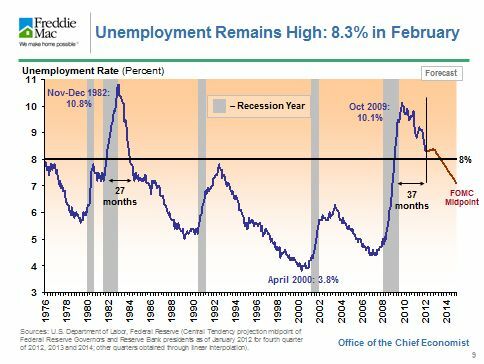 Nationwide, the unemployment figures fell to 8.2%, once again a promising sign; however this figure does not include many who have been out of work or who are ‘underemployed’ which, according to many economists, puts the real unemployment rate to around 15% or more. There are nearly 6 million people out of work (for longer than six months, not including those who have stopped looking for work), and the negligible increase in hourly wages further depresses the forward momentum of the economy and the ability for consumers to qualify for a home or have the confidence in our future to consider purchasing. As a result, the tax cuts and a politicized personal tax increase on individuals making more than $1 million annually are sure to keep the political economy hotly debated, but with this, very little by way of substantive changes will be put into effect and the momentum will continue. This is good news for the U.S. housing and real estate markets and will only improve consumer confidence in our economy. This trend will continue through 2013 depending upon how decisive the 2012 elections are and whether or not there are any political or economic events that impair consumer confidence. There are a few more national indicators to continue to watch, with their sources listed below – these forecasts also provide an insight into 2013 and 2014. 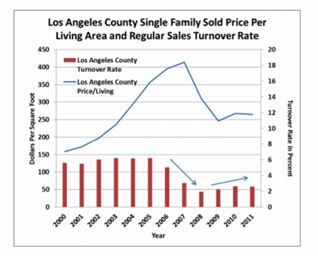 It is widely accepted that property values bottomed out in most markets in 2009. 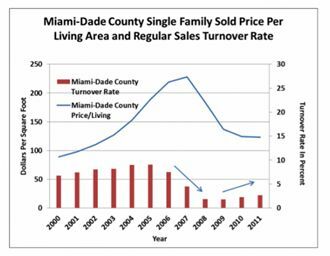 A good illustration of this trend is viewing the price per square foot in hard-hit Miami-Dade County and Los Angeles County (in the Sand States). You can see the low point around 2009, and the overall drop of 35-40% in overall valuation. Pro Teck Valuation Services, based in Waltham, Massachusetts, also presented the top 10 worst and best metropolitan areas in the United States. “The Miami and Los Angeles markets are highly representative of what we foresee for most of the important coastal U.S. real estate markets,” Pro Teck Chief Executive Tom O’Grady said. “In particular, we see stabilizing and then gradually increasing prices over the next few years.” The purchase market has been driven by bargains with a tremendous opportunity for appreciation; in many markets, there are plenty of deals to be had. Approximately 25-30% of the market are REO and Short Sales, which have driven approximately 30% of all real estate transactions to be all-cash transactions. 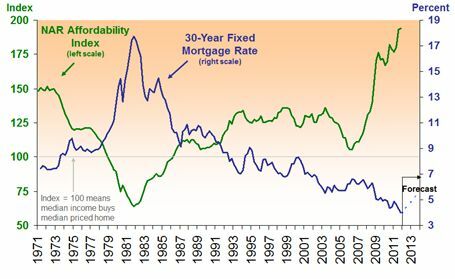 This is unprecedented, and it demonstrates a number of strong indicators that the housing market has indeed hit its ‘theoretical’ bottom in most markets. 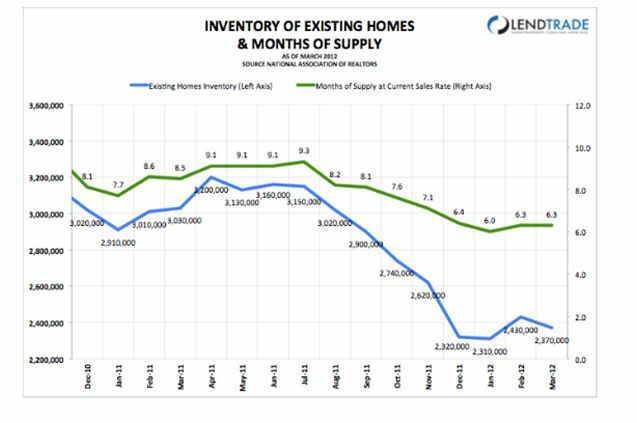 The “demand” for homes that are being sold at depreciated prices and/or short sales has established a new ‘bottom’; supply-and-demand principles affect this category as well and will create a longer-term “bottom hovering” of pricing as we are seeing today. Buy a Home Today; If You Can Afford to, Buy Two or More - DO IT! 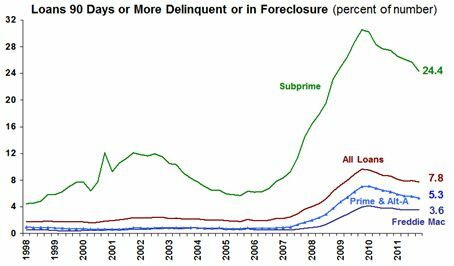 The Subprime and Alt-A product recipients between the years of 2004-2006 are the most delinquent on their payments which, as we all know, has driven much of the foreclosure crisis, or rather the shadow inventory that is working through markets. There is no question, the housing market is working its way through its own cleansing process, and various federal programs such as HARP1 and HARP 2.0 and various principal reduction proposals have targeted this inventory in order to accelerate this 45-month process. In an otherwise challenging forecast, light can be seen at the end of the tunnel. 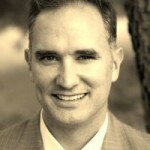 There is no better time to buy an investment property, a rental or vacation home, and given the lack of confidence in the stock market, the best 10-25 year investment for any qualified buyer just may be the late 30’s to mid-50-year-old buyers looking for investment properties to later unload to subsidize retirement living. This is the main point that many realtors and agents are simply ignoring or do not understand. If they did, they would market this difference. Given these trends, it is an exciting time to be in real estate and you can provide a life retirement or investment plan for your borrowers. You could partner with financial planners and advisors who help borrowers make smart investment decisions. We are at the bottom of the market and in most areas, the opportunity to purchase a home and benefit from true, bonafide appreciation is now. Connect. Get Involved. Get Informed. If you are a housing professional, it is important to get involved in your respective professional association. Whether it is your local chapter of the National Association of Realtors, National Association of Independent Housing Professionals or your state Mortgage association (broker or banker), the important thing is to get involved. To combat nearly three years of constantly negative press, the only remedy for this is to educate ourselves on the issues and then to be that source of information for the consumer. The mainstream media can say what they want, but the reality is, if we housing professionals aren’t competent and knowledgeable about their respective markets, there will be no reliable source of information other than part-time reporters or news commentators who simply aren’t qualified to adequately explain to the public the problem, the solution and the process to tie these two realities together. Pauline Craven, rising real estate producer for William Raveis, the third-largest family-owned real estate firm in the United States and the largest in the Northeast. And not to be outdone, Frank and Brian from Think Big Work Small were present to help facilitate the flow of the overall conference. There was a significant number of topics reviewed to appeal to the diversity of professional needs across the attendees of several hundred people. With topics that delved into unimplemented requirements and provisions as set forth by Dodd-Frank, the CFPB’s mandate to implement such rulings and to modify them for clarity in implementation, HVCC, Appraisal considerations, Escrow concerns related to the new GFE/TILA forms, Title and the broader implications on housing & real estate transactions. Approximately a third of the conference attendees were realtors®-agents/brokers, another third were mortgage professionals and the remaining third were service providers seeking to understand how better to serve their housing-related customers. It was an ideal blend to better understand the broader concerns confronting every aspect of the supply-chain of real estate and mortgage origination/funding. In forums like these, it becomes very difficult for realtors® to always blame the mortgage lender for details they generally do not understand, and likewise, it provides a forum for mortgage loan officers to better understand the housing dynamics, pressures and process flow of what it is to be on the front line of the transaction with the borrower from beginning to end. One of many challenges in housing/real estate is communication across several industries and disparate parties. Amidst the confusion, the consumer easily is the most affected by any breakdown in communication, and conferences such as these bring together housing professionals from across the process and seek to address these potential gaps. The best way to take advantage of the opportunities in the marketplace is to stay current on the trends, study the opportunities and learn to integrate these into your day-to-day business, so you can translate all of this into an overall net benefit to your company. This is the goal of these conferences and, naturally, the broader goal of this publication. Any questions or feedback on this article, email Rick Roque, Managing Editor of The NicheReport Real Estate Edition at [email protected] or call him at 408.914.5895.